This woodblock print was produced from an original painting on silk dating from the late 1920s whose current location is unknown. The indentification of this design as number 18 is original to Rakusan who published the print as the 18th design in his series of one hundred woodblock prints called 楽山花鳥畫譜, Rakuzan Kachou Gafu, lit. 'Rakusan's Flower and Bird Print Series'. Initial edition I publication of 18 was in January 1930 (or perhaps slightly later) in installment nine (of fifty). However, additional edition I printings of 18 may have continued until 1933. The copy illustrated here is typical of edition I. No later edition reprintings of 18 are currently known. 18alt, a woodblock print of an alternate sketch of the same design subject was issued the month before the initial printing of 18 as a preview advertisement (see Related Designs below). Edition I: Museum of Fine Arts, Boston, MA, USA; (1951) 51.2480 [not illustrated online]. Pomegranate, Punica granatum, 柘榴, 石榴, 若榴, ざくろ, ザクロ, zakuro, is an originally exotic deciduous shrub. In Japan it has been extensively hybridized and is widely grown for its large edible fruit, ornamental flowers, and decorative bark which make it popular also as a bonsai subject. In 18 Rakusan has shown buds, open flowers, and two immature fruits. Black-naped Oriole, Oriolus chinensis, is today usually called 高麗鴬, こうらいうぐいす, コウライウグイス, kourai-uguisu, lit. 'Korean warbler'. Although counted as a native species, it is only an unusual vagrant from the Asian mainland. Historically, it has often been kept as an exotic cage bird in Japan for its bright color and sweet song, and has several different names. 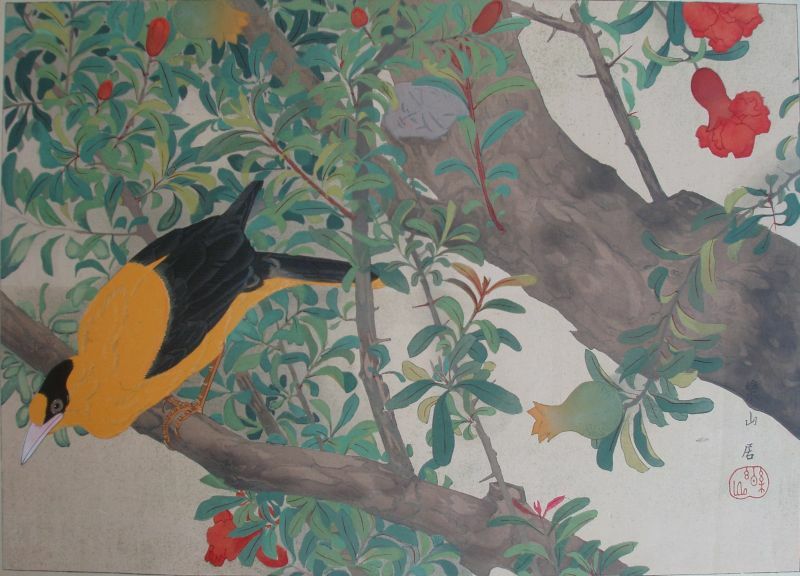 Rakusan would likely have been illustrating a captive bird in an aviary. In his title-caption for 18 Rakusan used instead a different name, 黄金鳥, おうごんちょう, オウゴンチョウ, ougon-chou, lit. 'gold(en)-bird'.